On 22nd September, Theresa May spoke in Florence, Italy, to discuss the UK's plans to leave the European Union. After what's been viewed as a difficult start to Brexit negotiations, Citi analysts believe the UK prime minister's third major speech on the subject was widely seen as constructive. In Florence, May made her first public proclamation that the UK would be willing to pay to hold onto current trade deals with the EU. Her suggestion was that the UK would contribute for two years after Brexit in an arrangement expected to cost around £9 billion per year. This would act to ensure that no other member state would have to pay more, or receive less than the current EU budget, which ends in 2020. This would provide the UK with a longer time line to negotiate the post-Brexit trade deals, with the country aiming to prevent a feared sudden drop in business markets. However, Citi analysts believe that the UK's obligations may stretch far beyond the budget, and the EU is seeking assurances that longer-term unpaid liabilities will be catered for. What is the Brexit divorce bill'? While the total cost of Brexit is still up for negotiation, May is now acknowledging that there will be a 'divorce bill' for the UK to pay. But Citi analysts say that working out the finer details of that is far from easy. With the UK having helped to back EU bail-out loans to other member states like Portugal, Ukraine and the Republic of Ireland, Citi analysts believe the EU will likely want to cover the chance of these loans defaulting by asking the UK to make these funds available. The idea would be that as each of the loans clears, the money will eventually be repaid. EU officials are applicable for EU-funded pension payments, something the UK too has to cover if the employee worked during the period of their membership1. As far as logistical costs go, two EU agencies – the European Medicines Agency and the European Banking Authority – are currently based in the UK, and will need to relocate after Brexit bills the UK will be expected to foot2. Any spend that was due to go to the UK from the budget will be discounted from the overall bill, as will the UK's usual rebate from EU contributions and a share of the union's assets. Despite a broadly negative sentiment towards GBP due to Brexit's unclear budgetary and judiciary conditions, Citi's experts are seeing indications that GBP could appreciate into the end of 2017. 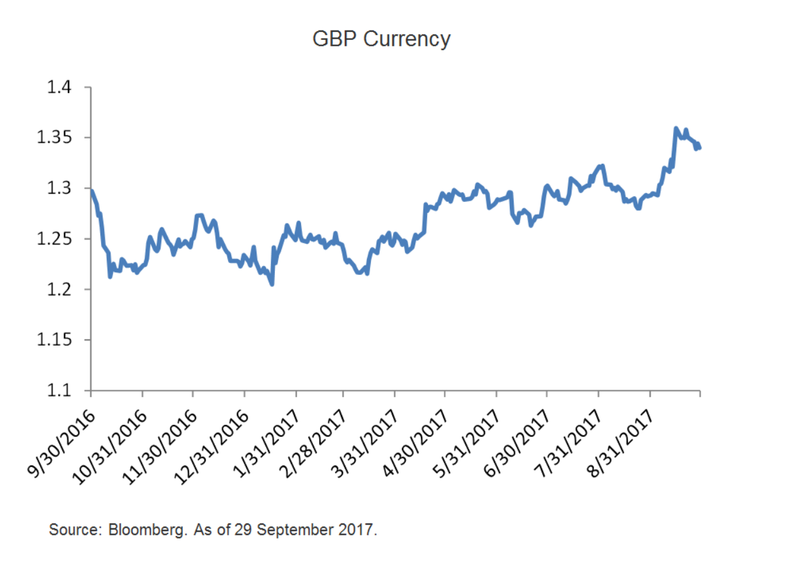 In the most recent FX forecasts (September), Citi Analysts expect GBP/USD to trade at 1.3900 in "0-3 months", providing upside from current levels. This expectation is also underpinned by a change in the outlook from the Bank of England; as they have brought forward the likely monetary policy tightening, with the potential for a 25bps hike to base rates at the November 2nd MPC meeting. However, with uncertainty expected to rise as the deadline approaches, Citi analysts forecast a Brexit cliff edge for late 2018 and early 2019. With Brexit concerns largely accounted for though, getting through some of the year's biggest Brexit events (UK-EU negotiations on 9th October and the EU summit on 19th-20th October) could yet prove supportive to GBP. If you're looking to minimise risk in an uncertain political climate, read more about optimising your investment portfolio. As always, your Relationship Manager is on hand to discuss all financial concerns.